SUMMARY: The hybrid technique of PET/CT has significantly impacted the imaging and management of HNSCC since its introduction in 2001 and has become the technique of choice for imaging of this cancer. Diagnostic FDG-PET/CT is useful for identification of an unknown primary tumor, delineation of extent of primary tumor, detection of regional lymph node involvement even in a normal-sized node, detection of distant metastases and occasional synchronous primary tumor, assessment of therapy response, and long-term surveillance for recurrence and metastases. The role of PET/CT is evolving in radiation therapy planning. Combined diagnostic PET/CT provides the best anatomic and metabolic in vivo information for the comprehensive management of HNSCC. Cross-sectional imaging with CT and MR imaging is commonly used for tumor staging and may allow detection of subcentimeter lesions. Locoregional lymph node metastases have a major impact on survival. Patients with lymph-node involvement have a worse prognosis (approximately 30%) than patients without lymph node involvement (>50% 5-year survival).6,7 PET using the radiotracer 18F FDG is widely used to evaluate patients with HNSCC. The hybrid technique, PET/CT, provides anatomic and functional information and can be performed as PET and DCT with intravenous contrast-enhancement (PET/DCT) or PET and noncontrast CT (PET/CT) for attenuation correction and anatomic localization. PET/CT is useful for identification of an unknown primary tumor, delineation of the extent of regional lymph node involvement, detection of distant metastases and occasional synchronous primary tumor, radiation-therapy planning, assessing therapy response, and long-term surveillance for recurrence and metastases. PET/CT imaging was developed to improve PET imaging by expediting attenuation correction and improving lesion localization.8 Hence, initial protocols for PET/CT imaging were designed to optimize the acquisition of the PET scan at the expense of the CT scan. For head and neck imaging, this meant that no intravenous contrast was used; a low-dose CT technique was common; and CT scans were reconstructed with a section thickness to match the PET scan (approximately 3–5 mm). Commonly, the imaging report emphasized the FDG-PET findings with CT findings described only if they were related to PET findings, were significant, or were obvious. The advantage of this approach is its simplicity and shorter time. The limitation is that most patients will need high-quality anatomic imaging for surgical planning, and this often requires a separate visit. With experience and improvement in technology, it is now possible to acquire a high-quality DCT scan for surgical planning and PET for metabolic imaging at the time of PET/CT imaging.9 This examination is referred to as PET/DCT-neck.10 The advantage of this study is to perform a comprehensive evaluation of patients with HNSCC in a single visit to the imaging department. The addition of a diagnostic-level CT scan to FDG-PET scanning affords hardware fusion of the images and the opportunity for a single report to incorporate results from both imaging studies. In general, nodal status and distant metastases are best evaluated by the PET component of the examination, but the morphology and relation of the primary lesion to critical anatomic structures are best evaluated by the CT component of the examination. The trade-off is an examination that takes longer to perform and interpret and requires technical and interpretive expertise in PET and CT modalities. At our institution, the head and neck surgeons have gravitated from the routine PET/CT to the more comprehensive PET/DCT. It not only images the neck with a diagnostic-quality CT scan but also includes the chest, abdomen, and pelvis to complete a CT scanning that matches a PET scanning from the skull base to the midthigh, providing both metabolic and high-quality anatomic imaging, the workhorse of oncology imaging. This examination provides a 1-stop shopping experience that simplifies scheduling, allows staging and surgical planning at the same time (Fig 1), and is convenient for the patient. A single report is provided by an attending radiologist who has expertise in both PET and CT modalities. Surgical planning and metabolic staging. A 50-year-old man with T4N2bM0 SCC of the right tonsil and base of the tongue. 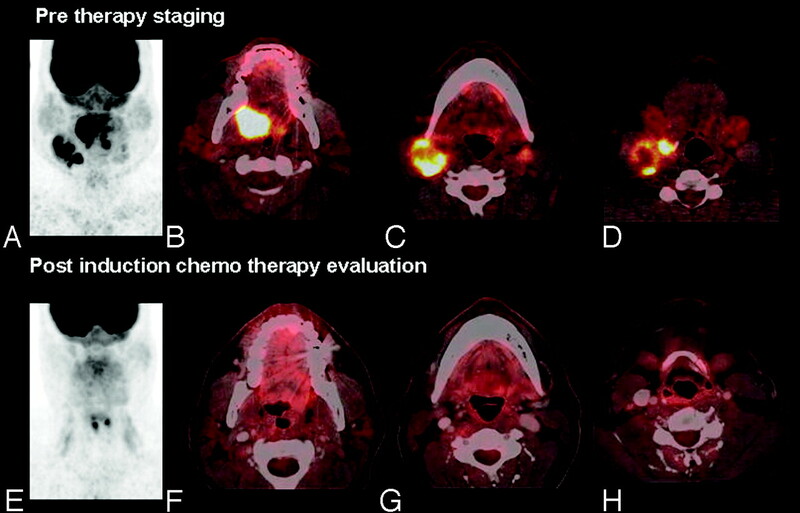 The contrast-enhanced CT component of the PET/DCT provides the high-resolution imaging necessary for surgical planning (red arrows), with the tumor involving the right tonsil and tongue base. The PET component of the PET/DCT provides the metabolic information about the primary tumor and locoregional and distant metastatic disease. The patient underwent resection with pectoralis flap reconstruction and concurrent chemoradiation. A and B, Contrast-enhanced CT of PET/CT. C−E, Fused PET/CT images. FDG uptake provides the primary tumor and metastatic lymph node metabolism (yellow arrows). The PET/DCT is performed in 2 parts. A dedicated PET/DCT for the neck is performed with the arms down and thinner CT sections (1.25 cm), by using a 256 PET matrix and 60 mL of noniodinated intravenous contrast agent. It covers from the skull base to the arch of the aorta, including the nodal chains draining the head and neck. The second part of the PET/DCT study covers from just above the clavicles to the midthigh with 100 mL of noniodinated intravenous contrast agent. Detection of unknown primary tumor. A 58-year-old man who presented with a right neck mass. A neck CT shows multiple enlarged necrotic right level II, III, and IV lymph nodes. FNA of the right level III node showed a metastatic poorly differentiated carcinoma with extensive necrosis. 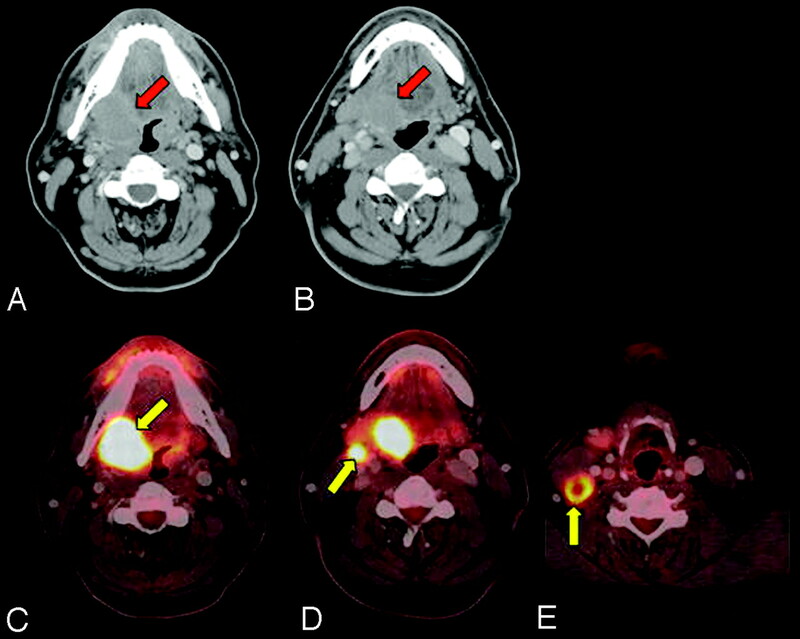 PET/CT showed a 1.0 × 1.2 cm hypermetabolic (gold arrow) and enhancing (red arrow) lesion at the right base of the tongue, large nodes in the right levels II/III, an 8-mm node at level IV, and no left-sided nodes or distant metastases. Direct laryngoscopy with biopsy and cervical esophagoscopy showed no lesions, but palpation showed a 1-cm firm right base of tongue lesion not crossing the midline, which was pathologically proved to be SCC. PET/CT is useful in identifying the unknown primary tumor in approximately one-third of patients after physical examination, anatomic cross-sectional imaging, and endoscopy. A−C, Fused PET/CT images. D−F, Contrast-enhanced CT of the PET/CT. Failure to detect an unknown primary tumor. A 50-year-old man who underwent a dental extraction in which the oral surgeon incidentally identified a right-sided neck mass that was tender to touch. FNA revealed moderate to poorly differentiated SCC. PET/DCT demonstrates FDG hypermetabolic (gold arrow) and enhancing (red arrow) lymphadenopathy in the right levels I-III and fails to reveal a primary lesion. Same-day rigid esophagoscopy, direct laryngoscopy, nasal endoscopy with biopsy of the base of the tongue bilaterally, and tonsillectomy showed no tumor. The patient was treated in all potential mucosal primary sites and the bilateral neck with IMRT to a dose of 69.96 Gy in 33 fractions with concurrent cisplatin. A, C, and D, Fused PET/CT images. B, Contrast-enhanced CT of the PET/CT. The limitation of PET/CT in identifying unknown primary cancers in the head and neck is due to the resolution of FDG-PET, which is limited to approximately 5 mm. Small or superficial lesions may be undetected. The basal uptake of FDG in the normal lymphoid tissues of the Waldeyer ring and the secretion of FDG from salivary glands would further obscure detection of small and superficial lesions. Accurate assessment of the primary tumor depends on the extent of the lesion and involvement of adjacent structures. Contrast-enhanced CT or MR imaging provides complementary information to physical examination and endoscopy and has become essential for primary-tumor assessment. MR imaging provides superior soft-tissue delineation and better assessment of perineural (Fig 4) and bone marrow extension of the primary tumor. Although PET is highly accurate in the detection of primary tumor,19,20 the resolution is inferior to CT and MR imaging in depicting the anatomic detail and the extent of the tumor that is essential for surgical planning. PET and PET/CT without contrast do not provide the anatomic detail sufficient for surgical planning purposes. PET/DCT provides the best combination of anatomic detail that is sufficient for surgical planning purposes and functional characteristics of a primary lesion. Perineural spread. A 65-year-old woman diagnosed with T4N0M0 SCC of the skin of the left upper lip and perineural spread along infraorbital nerve and VI to the skull base. PET/DCT demonstrates a hypermetabolic and enhancing mass in the left upper lip extending along the infraorbital nerve and at the skull base (gold arrows). MR imaging demonstrates these findings (red arrows) with higher resolution. The perineural spread is better depicted on the MR imaging than PET/CT due to higher resolution and small-volume disease along the nerve. A, B, and D, PET/DCT fused images. C, Contrast-enhanced coronal CT scan. E and G, Coronal T1 pregadolinium images. F and H, Postgadolinium coronal T1 images. Nodal spread is the most important prognostic factor in the management of all patients with head and neck cancer except those with thyroid cancer. The presence of metastatic lymph nodes in the ipsilateral or contralateral side of the neck or both significantly reduces the 5-year disease-specific survival rate in patients with HNSCC.21 The number of involved nodes, location, and evidence for extracapsular spread determine treatment and prognosis. CT and MR imaging are the preferred anatomic modalities to image metastatic nodes. CT is superior to MR imaging in diagnosing the metastatic nodes in the head and neck.22 One of the hallmarks of the metastatic node is increase in size. On the basis of pathologic findings, a minimum axial diameter of 10 mm was the most effective size criterion, while the best size criterion was 1–2 mm greater for the nodes at levels IB and II.23,24 However, smaller (<10 mm) nodes can harbor metastasis that could be imaged by metabolic imaging. FDG-PET is often superior to conventional anatomic imaging in detecting regional nodal metastasis at the initial staging of patients with HNSCC.25,26 PET is particularly useful in identifying metastatic nodes <10 mm that appear morphologically normal but are FDG-avid (Fig 5) or those in locations difficult to image with CT, such as supraclavicular nodes. In a review, an average sensitivity of 87%–90% and a specificity of 80%–93% were reported for FDG-PET.27 Recent advances in technology would improve the sensitivity, and hybrid PET/DCT would improve the specificity of metastatic nodal detection. Staging. A 62-year-old man with a stage IVa (T2 N2cM0) SCC of the tongue with a central necrotic right IB (red arrow) and right IIA (yellow arrow) FDG hypermetabolic lymphadenopathy. The left IIA lymph node (<10 mm) demonstrates FDG hypermetabolism, proved pathologically to be metastatic. Even smaller lymph nodes with apparent mild FDG uptake due to partial volume may harbor metastatic deposits. False-negative results are found in nodes that are small, necrotic, and metabolically less active and in those nodes that cannot be separated anatomically from the primary tumor. False-positive results are commonly due to reactive nodes. For this reason, usually tissue diagnosis is necessary in FDG-positive nodes, in which suspected metastatic involvement would significantly alter management or prognosis. With the increasing use of conformal radiation therapy and IMRT in the treatment of locally advanced head and neck cancer, target-volume definition has become of paramount importance. With conventional CT scanning with or without contrast, delineating the GTV is often difficult because there may not be a clear demarcation between tumor and normal tissue. Combining PET with CT is useful in aiding GTV contouring because the metabolic activity of the tumor demarcates the boundary between active tumor and normal surrounding tissue (Fig 6). By accurate GTV definition with the assistance of PET/CT, smaller expansions may potentially be used to create clinical target volumes and subsequent PTV, which are used as a basis for IMRT planning and creating optimal radiation-dose coverage of the tumor. Radiation therapy planning. A, Planning CT GTV in red and PTV in blue. Green and aqua contours represent elective nodal volumes. B, PET. C, Rigid fusion of planning CT and PET for radiation planning. The PET/CT scan was obtained in the treatment position with rigid immobilization in a thermoplastic head and neck mask. The use of PET/CT scanning in radiation planning and contour definition may, however, potentially underestimate tumor volume definition if areas of the tumor demonstrate necrosis or lack of metabolic activity. Thus, it is important to integrate diagnostic information, including contrast-enhanced CT of a PET/DCT or MR imaging, and clinical examination findings into a target definition for radiation planning and not to rely only on 1 imaging tool. In a series by Ford et al,35 tumor-boundary delineation by using PET was investigated and uncertainties in tumor-boundary delineation were studied as a function of the reconstruction method. The series found that PET-based contours were a sensitive function of threshold contouring level and that a 5% change in threshold contour level could translate into a 200% increase in volume. Hence, there still remains the potential for uncertainty of the tumor-delineation boundary by using PET imaging for radiation planning, and our knowledge of the application of PET/CT to radiation planning for head and neck cancer will continue to evolve as additional studies become available. Surgery and radiation therapy produce edema, hyperemia, fibrosis, and loss of tissue facial planes. Differentiation of residual or recurrent tumors from posttherapeutic changes by anatomic imaging with CT or MR imaging can be difficult. Some new therapies may be cytostatic instead of cytoreductive, in which successful treatments may not lead to a decrease in tumor size. Posttherapeutic changes, including scar tissue, which mimic residual or recurrent tumors on anatomic imaging, would demonstrate no metabolic activity on PET imaging. FDG-PET detects tumor metabolic changes as a response to therapy. The FDG findings in posttherapy examinations should be therapy- and time-specific. Surgery or chemoradiation or both are the mainstays of treatment for head and neck malignancy. Increased FDG uptake will be seen in recently irradiated tissues and appears to be more intense in tissues that receive the highest radiation. Radiation-related FDG hypermetabolism may last ≥12–16 months after therapy.36 There is overlap in the SUVs of radiation-related FDG uptake and tumor recurrence, which may pose a problem for interpretation, especially if the PET/CT is performed within 2 months of therapy. PET/CT is more accurate when performed at 3–4 months after the completion of radiation therapy than at earlier time points,37–39 likely due to reduction in the nonspecific inflammatory uptake. PET/CT had a higher specificity for detecting persistent tumor after radiation therapy than contrast CT alone, and the specificity of PET/CT was highest when it was performed after 8 weeks of treatment.30 In our institution, we perform posttherapy PET/CT at least 8 weeks after completion of radiation therapy. FDG hypermetabolism associated with chemotherapy-related inflammation is a minimal problem compared with radiation-induced inflammatory uptake and usually subsides to normal within a week. In our institution, we image the patients just before the next cycle of chemotherapy to assess therapy response. 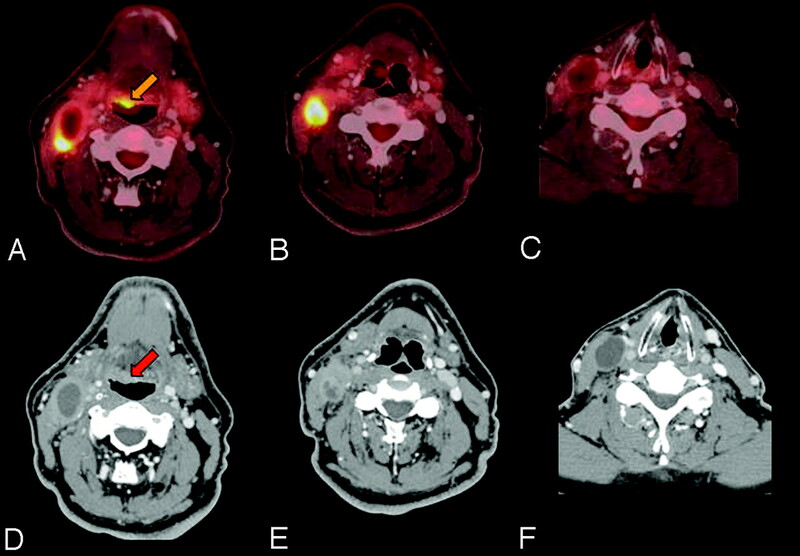 A number of studies have shown that PET can detect residual tumor after chemoradiation more accurately than conventional imaging.37,40–42 However, due to inflammatory uptake, a positive PET/CT result in the head and neck must be correlated with the physical examination and a tissue biopsy may be warranted. A greater potential impact of FDG-PET is its ability to exclude disease, thereby avoiding the further investigation or more extensive local or systemic treatment. 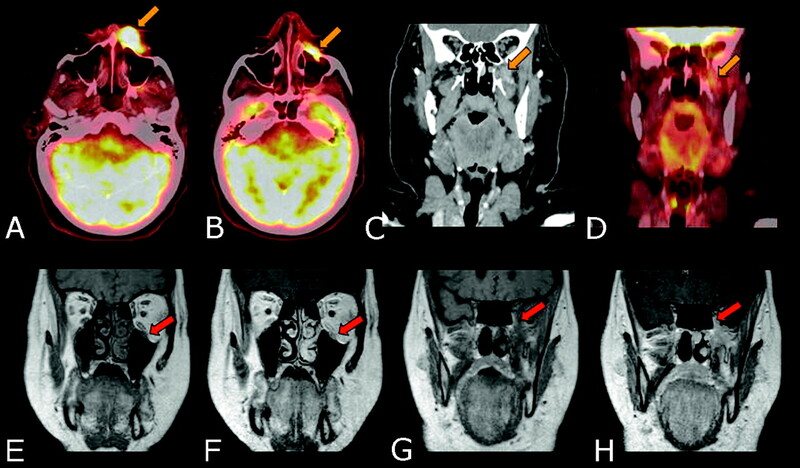 Many studies have demonstrated the very high negative predictive value of PET/CT in posttherapy assessment of head and neck malignancy (Fig 7).30,37,38,43–46 Porceddu et al38 demonstrated that a negative PET/CT result is highly reliable when PET/CT is performed at least 2–3 months after the completion of therapy. In this study, 39 eligible patients who had a residual mass in the head and neck underwent PET scanning at a median of 12 weeks (range, 8–32 weeks) after therapy. PET showed no metabolic activity in these patients. Five of these patients had neck dissections, which were all pathologically negative. The remaining 27 patients were observed for a median of 34 months (range, 16–86 months), with only 1 locoregional failure. The negative predictive value of PET for viable disease in a residual anatomic abnormality was 97%. When a posttherapy FDG-PET/CT demonstrates residual uptake, it requires tissue diagnosis and possible salvage surgery (Fig 8). Therapy assessment, complete response. A 39-year-old male patient with a stage IVa (T4N3M0) SCC of the right tonsil who underwent induction chemotherapy. A postinduction therapy PET/DCT demonstrates complete metabolic resolution of the primary tumor and nodal metastases. A and E, Maximum intensity projection views. B−D and F−H, Fused PET/CT images. Therapy assessment, partial response. A 67-year-old male patient with a history of recurrent SCC of the oral tongue, SCC of the midesophagus, and SCC of the left soft palate (T2N0M0) status postresection with negative margins, who presented with a recurrent left neck mass. The pretherapy PET/CT demonstrates FDG hypermetabolic left level I nodal recurrence (red arrow), and the patient completed chemoradiotherapy to the recurrent tumor in his left neck with IMRT to a dose of 70 Gy. A 12-week posttherapy PET/DCT scan demonstrates residual activity (gold arrow) in the periphery and central necrosis of the left neck nodal mass, representing partial response and a new recurrence of the esophageal malignancy (green arrow). All patients with HNSCC are at high risk for tumor recurrence and development of a second primary tumor in the aerodigestive tract. Tumor subsite, the stage of tumor at presentation, nerve invasion, extracapsular lymph node spread, and positive margins predict a higher risk of tumor recurrence. Persistent smoking and alcohol consumption are ongoing risk factors. The only meaningful way to detect possible recurrence by anatomic modalities such as CT and MR imaging is by change in size or possible contrast-enhancement of an abnormal area. 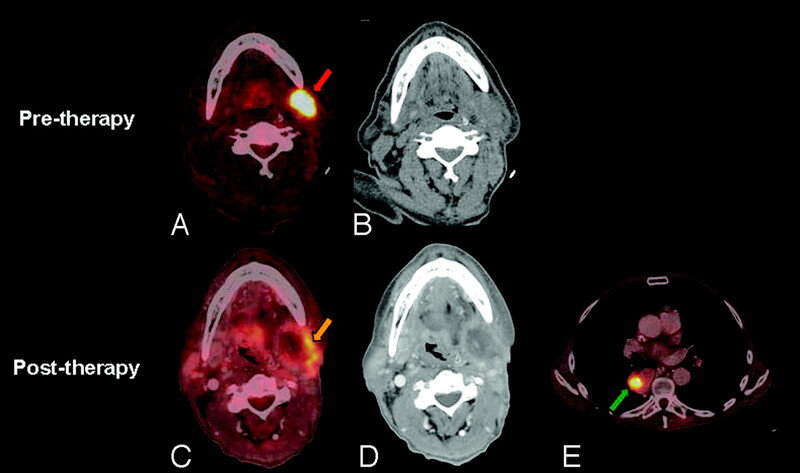 The superiority of PET to anatomic imaging modalities for identifying local and regional recurrence of head and neck cancer after therapy has been demonstrated in a number of studies.19,37,44,47–50 Lowe et al49 performed a prospective study of 44 patients with stage III or IV head and neck cancer with serial posttherapy FDG-PET studies. PET was performed twice during the first posttreatment year (at 2 and 10 months after therapy) and thereafter as needed. After therapy, patients were grouped on the basis of tissue biopsies into those who achieved a CR and those who had RD. Patients who achieved a CR were further grouped into those without evidence of disease and those who had recurrence by 1 year after completion of therapy. Disease status as determined by physical examination, PET, and correlative imaging was compared. Eight patients were lost to follow-up, and 6 had RD after therapy. Of the remaining 30 patients with a CR, 16 had recurrence in the first year after therapy. Five of these 16 patients had recurrence detected by PET only; 4, by PET and correlative imaging only; 5, by physical examination and PET only; and 2, by physical examination, correlative imaging, and PET. Only PET detected all recurrences in the first year, and it performed better than correlative imaging (P = .013) or physical examination (P = .002) in the detection of recurrence. In the setting of surveillance, numerous studies have demonstrated that 18F-FDG-PET/CT has a relatively high sensitivity for detecting recurrent disease at the primary tumor site and regional lymph node metastases.37,38–45,49–52 For patients who underwent PET or PET/CT at least 12 weeks after the completion of all therapy, the reported sensitivity ranged between 90% and 100% for the detection of recurrence. Due to nonspecific inflammatory uptake, the specificity of PET and PET/CT is between 63% and 94%, and a tissue biopsy or short-interval repeat scanning is warranted. If initial biopsy findings at the site of a PET abnormality are negative, a repeat biopsy or close follow-up with PET/CT should be undertaken to minimize biopsy sampling errors. Some studies have suggested that FDG-PET does not appear to be sufficiently sensitive (40%–75%) or specific (25%–64%) in identifying the presence of micrometastases in cervical nodes after completion of chemotherapy.43,53 However, a recent study demonstrated a sensitivity, specificity, positive predictive value, and negative predictive value of 100%, 84.2%, 62.5%, and 100%, respectively, by using an SUVmax of <3.0 as the criterion for negative findings on FDG-PET.52 In this study, 24 hemi-necks in 23 patients with residual lymphadenopathy underwent neck dissection or FNA. The pathology correlated strongly with the postradiotherapy FDG-PET studies. All patients with negative finding on postradiotherapy FDG-PET and those with an SUVmax of <3.0 on the postradiotherapy FDG-PET were found to be free from residual viable tumor. There are no evidence-based recommendations for the frequency of surveillance of PET/CT studies in the management of head and neck cancer. In our institution, we recommend a surveillance PET/DCT every 6 months for 2 years from primary therapy and thereafter every 12 months for another 3 years. In summary, PET/DCT is useful for identification of an unknown primary tumor, delineation of extent of primary tumor, regional lymph node involvement, distant metastases, and occasional synchronous primary tumor, assessing therapy response, and long-term surveillance for recurrence and metastases. The role of PET/CT is evolving in radiation therapy planning. Combined PET/DCT provides the best anatomic and metabolic in vivo information for the comprehensive management of patients with head and neck cancer.